Kisharon’s i-connect programme is an exciting and meaningful way to mark your year. This programme is also suitable for pre and post bar/bat mitzvah students who may be taking part in the Yoni Jesner or Duke of Edinburgh Awards who wish to build up community volunteering hours. 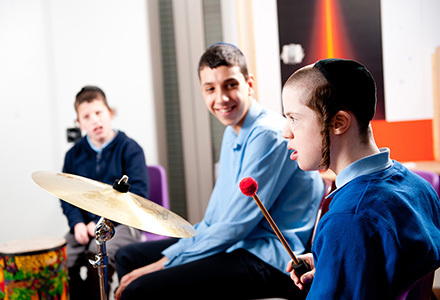 Kisharon’s i-connect programme is designed to encourage mainstream students to think about their situation, meet others who are different to themselves and despite these differences to find ways of communicating. Over the years, it has had tremendous success in building bridges between our students and those from mainstream education and breaking the barriers of discrimination. It is a wonderful experience for everyone involved. An induction to Kisharon and an overview of our different services. Discussing what it means to have learning disabilities through interactive games and activities. Undertaking a creative activity with people we support. Planning and taking part in a fundraising project. Raising £200 to buy an i-pad or communication software for a person supported by Kisharon. Or fundraising to purchase equipment for Tuffkid Nursery, a sandpit, play kitchen or specialised sensory toys for example. Presenting the equipment to a person with communication difficulties. Volunteering on a regular or ad-hoc basis with Kisharon. The experience centres around connecting: connecting with people who have learning disabilities, connecting with yourself by experiencing unchartered territory and furthermore assisting someone who has problems speaking by giving them an i-pad, or other equipment, with special software. Many pupils at Kisharon’s day school require additional support to develop their speaking and listening skills with communication at the heart of the school’s curriculum. 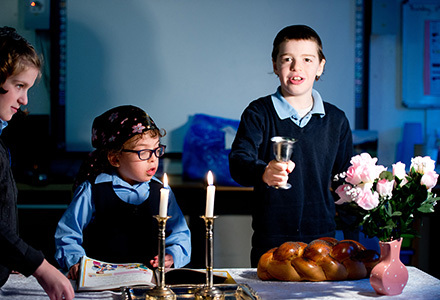 I-connect invites students to join Kisharon for the length of their bar/bat mitzvah year with the hope they will wish to continue supporting Kisharon into the future. The programme is flexible and we work with parents and students to accommodate a suitable timetable. We understand that this is an exciting but also a pressurised time and do not want to add any extra demands on participants. During the school holidays, we welcome students to help at one of Kisharon’s many centres, for example helping at Head Office in Hendon, the Bike and Print Shop or with fundraising and community events as well as joining in any other suitable age-appropriate activities for example camps and after-school clubs. Students are able to record the hours they volunteer towards awards such as Yoni Jesner and Duke of Edinburgh. For more information about a Yoni Jesner award, go to: www.jlgb.org/yonijesner. Past students have told us that they were nervous, tired and even excited at the start of the first session, but most of them left feeling “inspired and wanting to get involved”. The result is that students learn about learning disabilities, break down barriers and come away with a meaningful experience. For more information contact : Francine Haagman on 020 3209 1169 or email volunteer@kisharon.org.uk. Want to sign up right now? Complete the youth application form.